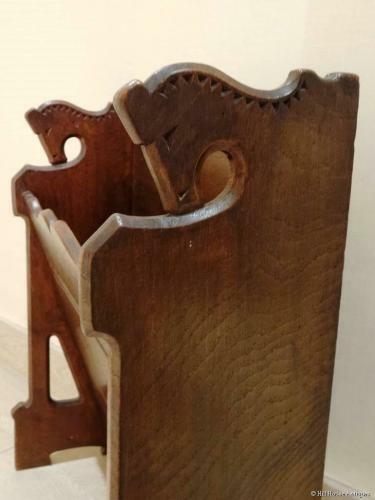 An unusual and very stylish/muscular (and previously unseen model) oak Arts & Crafts magazine rack/holder by Liberty & Co (labelled & numbered to underside) with Celtic/Norse style horse head carvings to top sides (that also act as carrying handles) and further rounded triangular piercings to base sides. Very much attributed to Leonard Wyburd, their Design Director; c1900. Approx 22"high, 19.25" wide, 7.5" deep.